Our next concert is the Verdi Requiem at St John's in the Square, Wolverhampton on 13th April 2019 in collaboration with The Wombourne and District Choral Society who are celebrating their 90th year this year. Conductor Ian Clarke will be in charge of the performance which we expect to be of the highest standard. Tickets are £15 (free for under 16s) and can be obtained from the box office 01902 744447 in advance or on the door on the night. We hope all our members and regular audience have had a good summer. We start our rehearsals on Monday 10 September, and new members will be very welcome. This season we are collaborating with Wolverhampton Symphony Orchestra to commemorate the centenary of the end of the First World War, with a major performance of Faure's Requiem and Beethoven's 9th Symphony. This concert will be held at Walsall Town Hall on 11th November, and will feature visiting choirs from France and Germany. Following that we will be preparing our Christmas carol concert, a warm and traditional affair with mince pies, at Cranmer Methodist Church, on Monday 17th December. What better way to start the festive season! Not long till the summer concert - with or without summer! After a fantastic success with the St John Passion, we are shifting gear completely for our summer concert. We are really excited to be teaming up with the Wolverhampton Community Brass Band for a joint concert at Beckminster Methodist Church on Saturday 9 June at 7.30 pm. With everything from a bit of Mozart to Queen, the programme will be full of variety, light and shade. Some old favourites and some new surprises, and a chance for a bit of community singing. What's not to like? A music-filled evening for all the family! Our Easter concert is a full-scale performance of Bach's monumental work "The Passion of Our Lord according to St John". 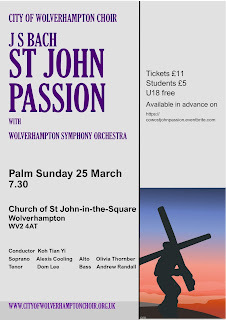 This concert is on Palm Sunday, 25 March, in the Church of St John in the Square, WV2 4AT and starts at 7.30. 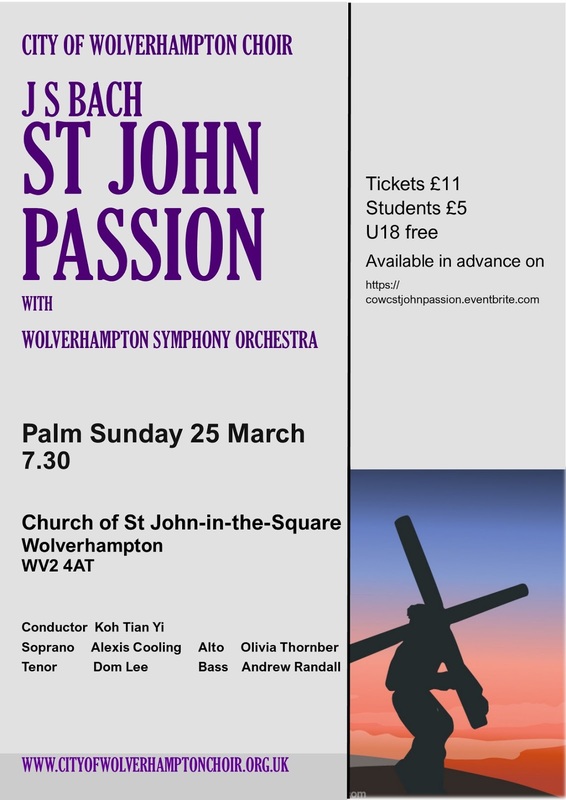 We are delighted that Wolverhampton Symphony Orchestra is joining us for this concert, plus a group of excellent professional soloists. Don't miss this major musical event for Wolverhampton! Our 'Home for Christmas' concert was a great success yesterday evening, with a super audience and the choir in good voice. We sang a selection of favourite carols and songs, and raised the roof with 'Good King Wenceslas'. Thanks to everyone who came and shared the evening with us. We'd like to say a special thank you to our accompanist Bogdan Suciu, who is leaving us to take up other challenges in the New Year. Do you ever think "I would love to sing in a choir, but my voice isn't good enough"? Put that thought out of your head straight away. You don't need a 'good' voice to sing in a choir. Every choir has its own sound that's made up of all the 60 or so voices singing together, so it's not necessary to be a good soloist, but to be a good listener. And to be willing to use the voice you have! 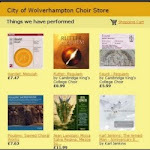 City of Wolverhampton Choir is recruiting and we would love to welcome you to sing with us. We are a friendly lot. It doesn't matter if you are not sure whether you are a bass, a tenor, an alto or a soprano. For the first few weeks of this term, with our musical director Koh Tian Yi, we're going to be doing lots of different activities to help find which voice we are most comfortable with. There may be one or two surprises along the way, even for people who have been singing for a while. Also, it doesn't matter if you don't read music 'by sight'. We are planning activities to help you learn how to find your way along a line of music. We can also point you to lots of web content that will help speed up your learning. Why not come and give it a go? We meet on Monday evenings at the Cranmer Methodist Church in Newhampton Road West, WV6 0RS, from 7.30 to 9.30. There is plenty of parking and it's accessible for people with disabilities. And don't worry, we meet in the church because it is a good place to rehearse. This is not a church choir, but a choir for the city. We welcome everyone, whatever their religion or background. We have two concerts planned for the months ahead. The first will be a winter concert in December with short seasonal songs. 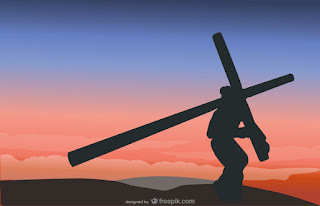 The second will be a performance of the St John's Passion by Bach, in the spring. We will have several months to prepare for this so that we know it really well and can throw all our energies into giving a great performance. Come and join us! If you feel a bit shy or have any questions please drop us an email, or phone Kate on 07988191344. Our upcoming Summer Concert is going to be a delightful mix of old favourites and new surprises. We are going to make this a really informal event and are not even selling tickets. Just come along, bring the family, take your seats, sit back and enjoy. Then make a donation! The programme will be fairly short and light, and we'll be following up with a buffet social. Venue - Cranmer Methodist Church, Newhampton Road West, Wolverhampton, WV6 0RS. This is a lovely modern and comfortable church with generous parking. Time and Date - 7.30, Saturday 1 July 2017.